Transboundary water cooperation is necessary to manage shared waters in an integrated and sustainable way. It has the potential to generate many significant benefits for cooperating countries, such as accelerated economic growth, improved human well-being, enhanced environmental sustainability and increased political stability. Nevertheless, many challenges can prevent or delay countries from embracing effective joint management of transboundary waters, including because of an incomplete or biased perception of the benefits that could be attained. As cooperation is one of the main obligations of the United Nations Economic Commission for Europe Convention on the Protection and Use of Transboundary Watercourses and International Lakes, countries preparing for accession to or implementing the Convention naturally reflect on what benefits such cooperation can bring. A benefit assessment exercise can help these countries to fully realize the potential benefits of cooperation, including by uncovering previously overlooked benefits and identifying opportunities arising from increased cooperation. It can therefore provide arguments and compelling evidence for cooperating and help to ensure the much-needed political support and funding for the cooperation process. includes the separate but related tasks of identification, assessment and communication of benefits. 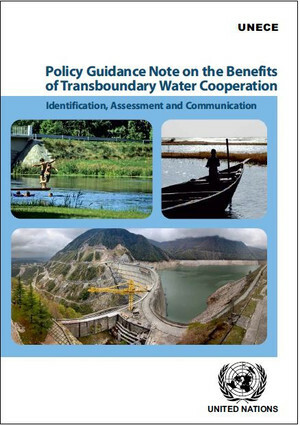 This Policy Guidance Note suggests how to approach those tasks, as well as how the assessment of benefits can be integrated into policy processes to foster and strengthen transboundary water cooperation. Download this publication in English, French or Russian.